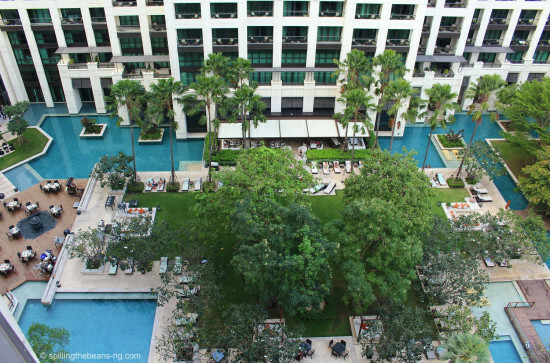 Located in the thriving center of Bangkok in a major shopping, entertainment and business area, it is one of the few hotels in this hectic part of the city that actually feels like a resort. 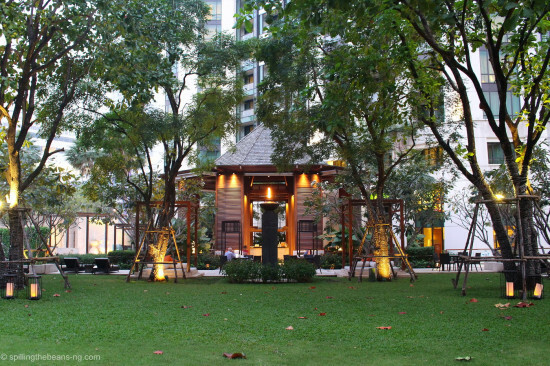 The hotel grounds are massive and wonderfully green; a soothing sight in contrast to the surrounding skyscrapers – like an oasis within the concrete jungle. 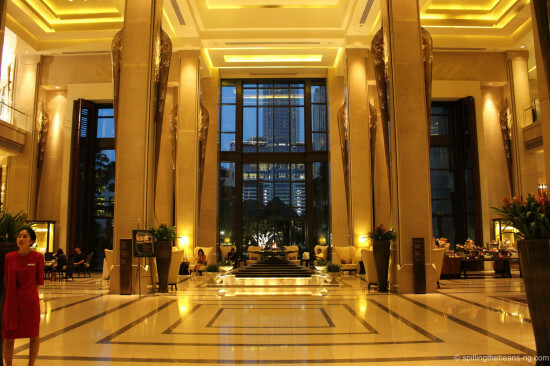 And I recently got a chance to stay a night at this oasis. 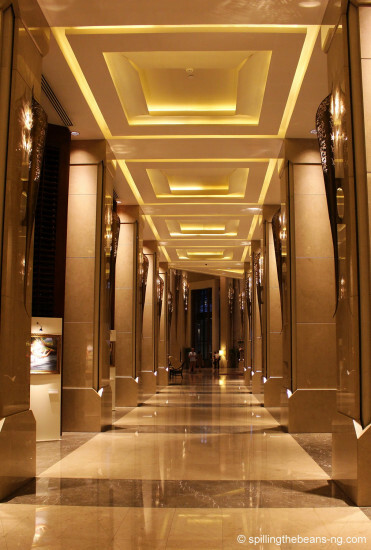 The architecture is exceptional and whenever I walk into this hotel, the lobby always wows me – it is opulent, with a strong marble predominance, jaw-dropping high ceilings and pillars that go on forever. 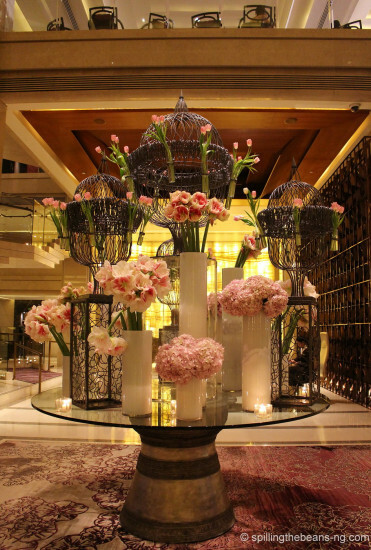 Huge and elaborate floral centerpieces further enhance the lobby. 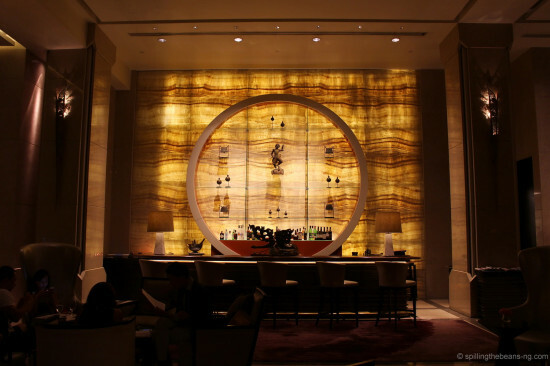 And I just love the sleek and beautiful lamps that can be seen throughout the hotel. 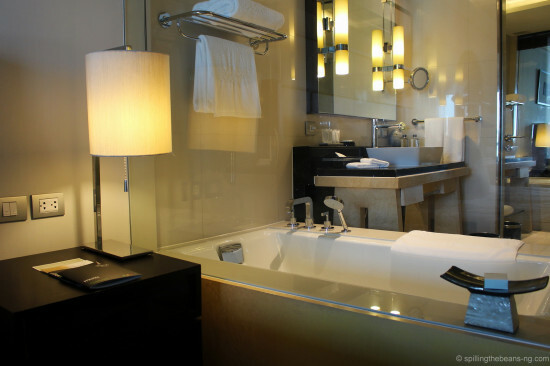 Our Deluxe room in the Royal Wing was spacious, modern and comfortable, and the bathroom was quite lavish. 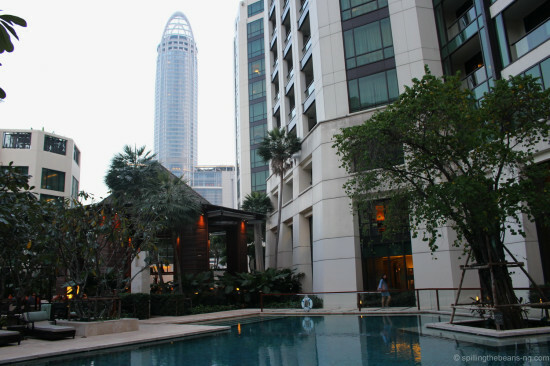 From the balcony, the views were fabulous – a look down to a sight of lush landscaped gardens within the hotel and numerous swimming pools; a look up, and a wave of skyscrapers. 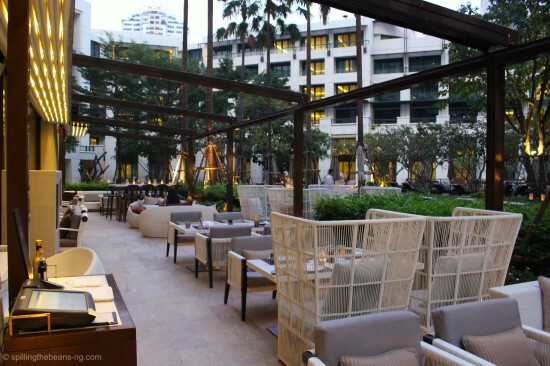 After taking some pictures and admiring the sights from my balcony, I headed to the casual all day dining restaurant, Niche, to meet up with the lovely Ms. Yanisa Ratanakosit (Director of Public Relations). 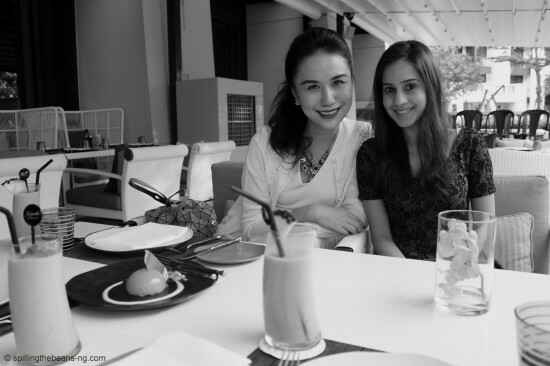 Just a few minutes in and I was glad to discover that she too had a sweet tooth, so over pleasant conversations we enjoyed afternoon sweets. 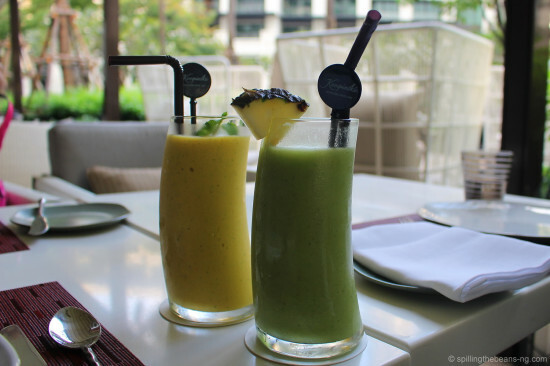 The smoothies were refreshing and delicious. The Yellow Submarine included Mango, Passion fruit, vanilla extract and fresh mint, and the Typhoon (a less destructive one) had avocado, pineapple, fresh lime juice, ginger and fresh mint. 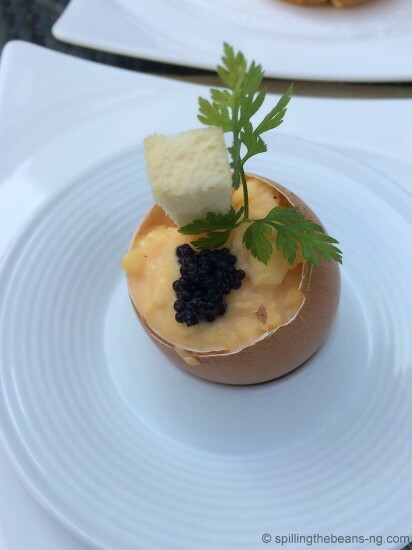 We then savored some ‘Siam Passion’, which holds the special title of Kempinski dessert of the year 2014. And what a deserving winner it was. 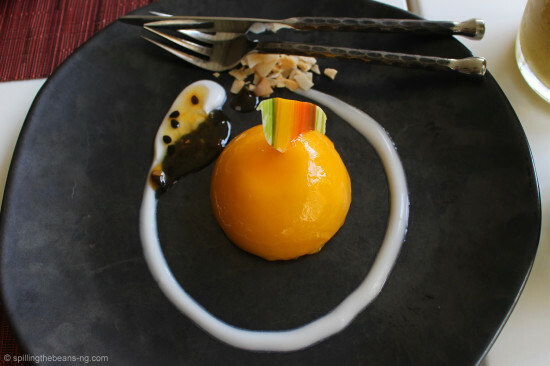 Beautifully capturing the essence of Thai fruits and culture, this delicious dome consisted of passion fruit, mango, coconut and banana. 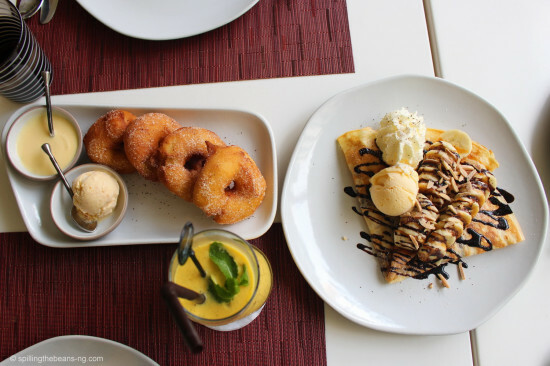 Next that followed were apple fritters served with vanilla ice-cream and crepe with banana, chocolate sauce, almonds and vanilla ice-cream. A sweet afternoon soon turned to evening. 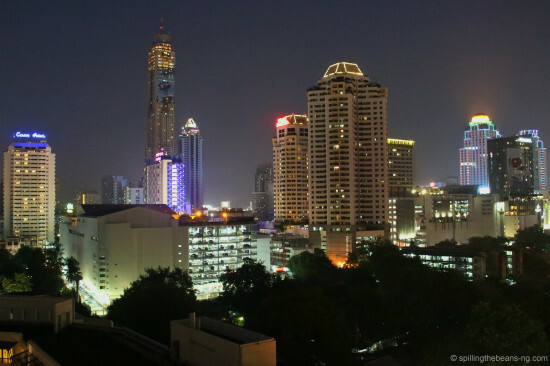 I looked out from my balcony and saw the amazing Bangkok skyline light up. 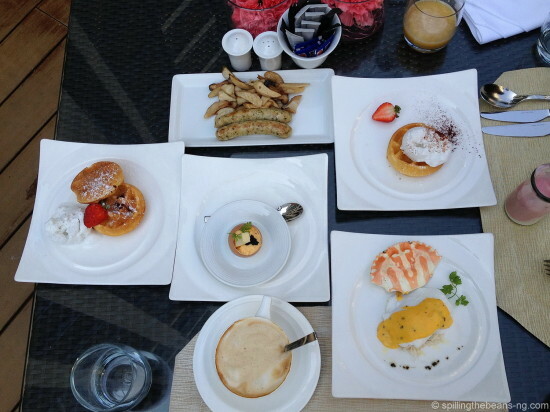 Next morning, the breakfast at Brasserie Europa was also indulgent. 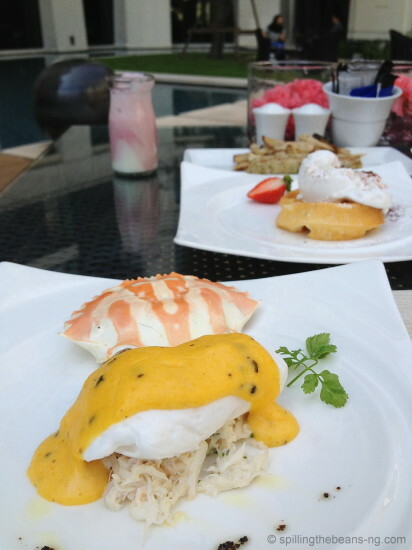 We ordered poached egg with crabmeat and hollandaise sauce (named Phuket) and scrambled egg topped with caviar (Huahin). The waffles were tasty too. And the free-flow champagne didn’t hurt – definitely my idea of a champion’s breakfast. The pools were too inviting not to swim in. And also, I needed something to do in between meals! 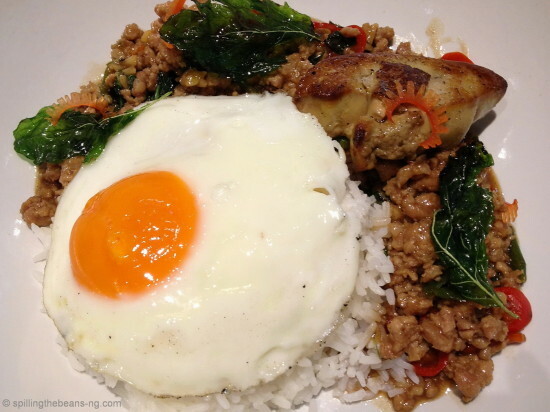 For lunch we tried Kraphao Moo (Minced pork stir fried with basil leaves) in an interesting variation, with the addition of Foie Gras. 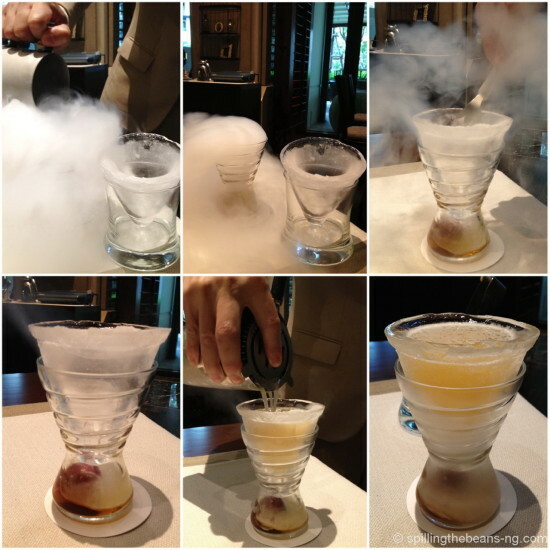 We also sampled the signature cocktail, ‘Yod Nahm’ which means water drop. Prepared right in front of us, it’s a Cognac, lime juice and Pandan leaf syrup concoction served in an ice glass. Water from the ice glass drips into the bottom glass which has Cognac and grape, so after enjoying the chilled tipple in the ice glass, you get another drink in the lower glass. 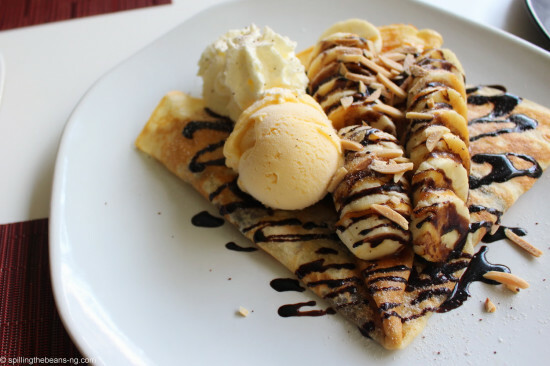 It was exciting, tasty and perfect! 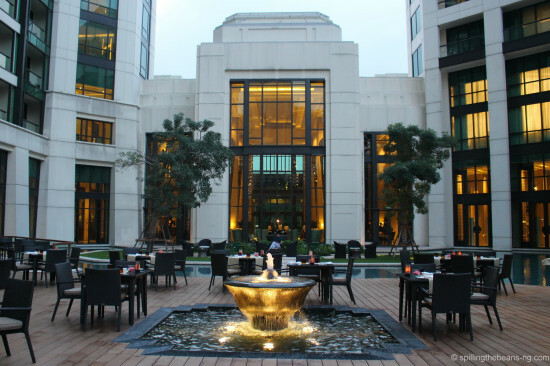 Opened since 2010, with 303 rooms and suites, plus 98 serviced residences, along with excellent dining, fitness center and spa, the Siam Kempinski Hotel is a great choice if you’re looking for resort-like surroundings, and some peace and respite in the City of Angels. 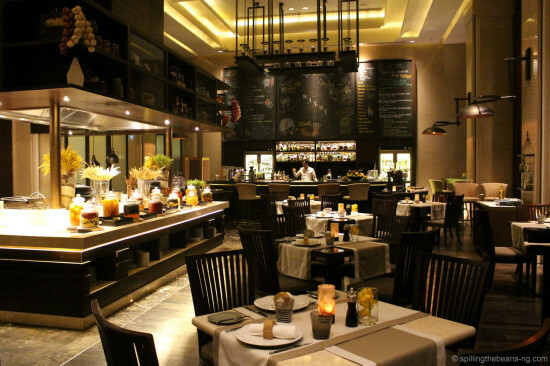 One of Asia’s 50 Best Restaurants for 2014, Sra Bua by Kiin Kiin, which serves classic Thai cuisine prepared with innovative techniques, is also situated in this hotel. 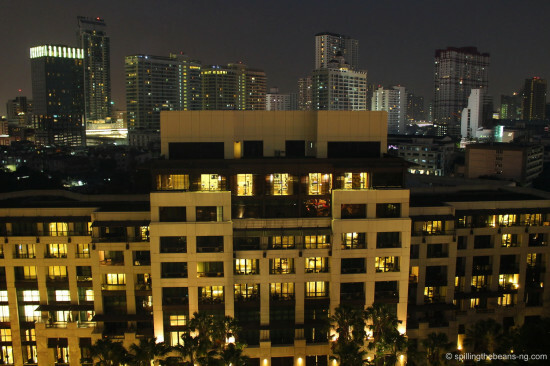 Shopaholics will rejoice too as it’s adjacent to the famous shopping mall, Siam Paragon and within walking distance to several other department stores. 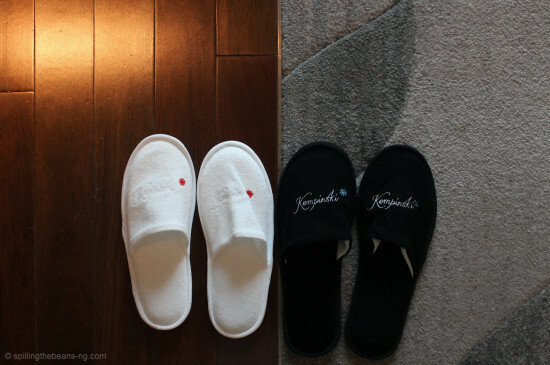 Bathroom slippers – Yin and Yang? 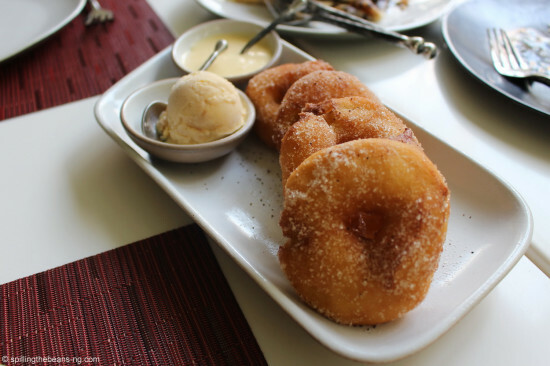 I just had breakfast but these food photos – mouth-watering and I remember I have vanilla ice-cream in fridge. I am going to have it just now. Thanks for sharing photos. Haha.. Thanks Tushar! Hope the ice-cream was yum! 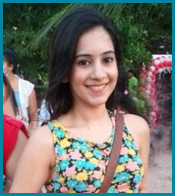 Thank you very much Shikha! I really appreciate all your kind words and support always Learning as I go, so I’m glad you like the photos! It was indeed a lovely, relaxing and fab experience. If you’re a fandan (fan of pandan :D) you should try that drink when you’re in Bangkok next 😉 Thanks again dear! 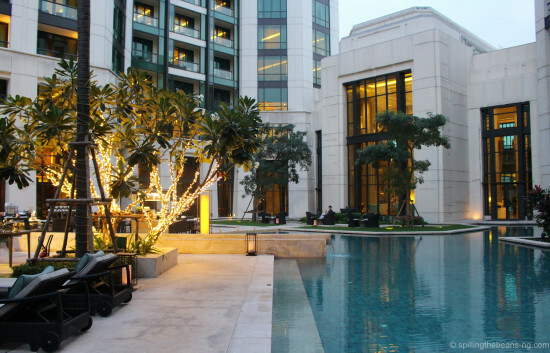 I love Siam Kempinski and never stay somewhere else when I’m in Bangkok. 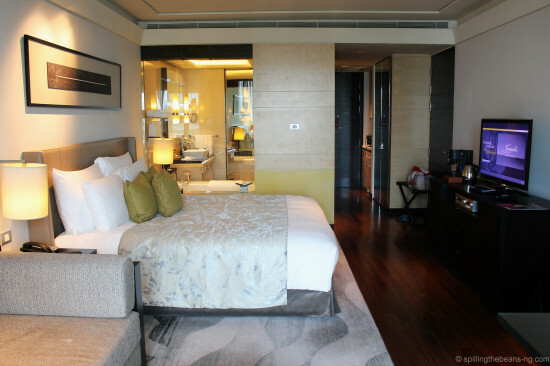 Though I need to say the deluxe rooms are nice but I would book at least one category higher ( Primer or even better Executive or cabana etc.) 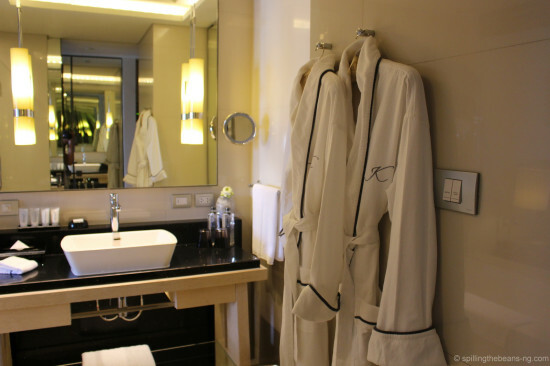 Hose rooms are much nicer – comparing to some other hotels the normal deluxe rooms of the Kempinski are not really special or “luxery”. I love the service and that they are always willing to go beyond “normal” services to please their costumer like listening to extra wishes and helping out when we they can. It’s also perfect for families as they have a very nice free kids club! The fitness studio is amazing too! I haven’t tried the spa yet, but I sure will at my next stay. Hey Natasha! 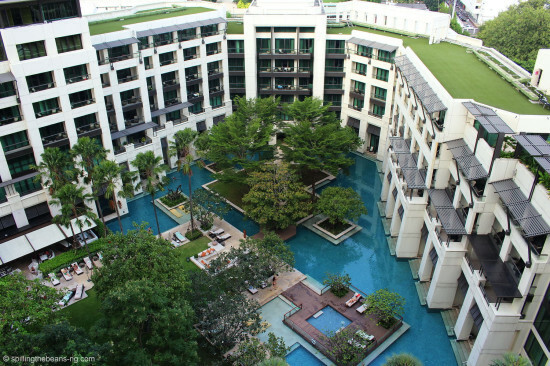 It’s a special hotel for sure and a great choice for Bangkok Enjoy your holiday!